In this last post of the series, Daniel will share information about prehistoric penguins. Like South America, Australia was just a short distance from Antarctica during the Eocene Epoch but would later drift northwards. Despite being much larger than New Zealand, Australia has far fewer penguins. 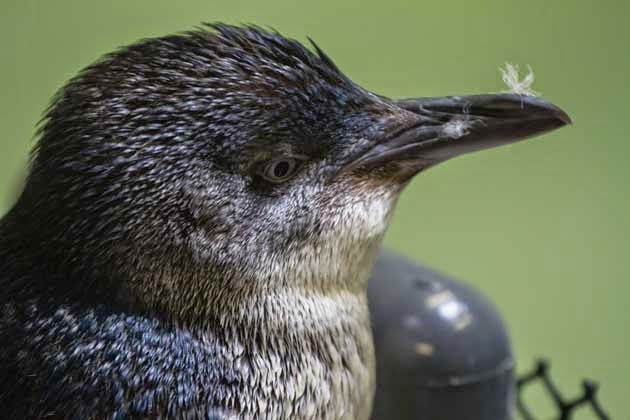 Today, the only penguin that breeds on the Australian mainland is the little blue penguin, a tiny bird that stands, or perhaps one should say hunches, about one foot tall. This delightful species can be seen at the New England Aquarium, and in fact many of the individuals in the enclosure are birds who were hatched in Australian zoos from rehabbed parents but could not be released in the wild and needed a safe new home. Our knowledge of Australia's ancient penguins is very fuzzy, coming from just a handful of fossil specimens that have been collected over the years. Palaeontologists have discovered evidence that penguins made it to the southern coast of Australia by the Eocene Epoch, and some reached sizes that would have made a little blue penguin look like a bug. However, with only bits of flipper bones and similar scraps left behind, these ancient penguins have revealed little about their overall appearance. The large species vanished before modern little blue penguins started arriving from New Zealand, but we do not know why. Bones of penguins have been found in pre-colonial middens, indicating humans hunted some species during the pre-colonial era. However, most of the large extinct penguin species such as Anthropodyptes gilli were long gone by the time humans appeared on the scene, so overhunting cannot completely explain why Australia is so depleted of penguin diversity today. 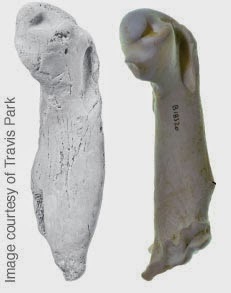 compared to the same bone from a modern emperor penguin. Finally, we reach Africa. Africa appears to be the last major landmass that penguins reached in their sweeping journey across the southern ocean. The oldest penguin fossils discovered in African sediments come from the Saldanha Steel site and are between 10 and 12 million years in age. These bones were fortuitously exposed while an industrial steel plant was being constructed, which is an isolated incident. Indeed, one extinct species of African penguin is named Nucleornis insolitus because it was discovered during construction at a reactor site. 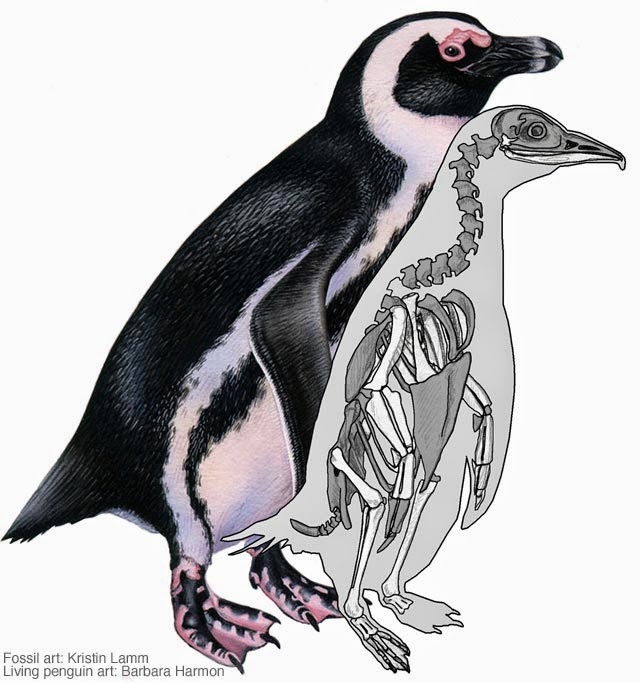 There seem to have been at least four different species of penguins living side by side in Africa in the past, swimming along the coast of an area inhabited by such oddities as the extinct African Bear (Agriotherium africanum) and the short-necked giraffe (Sivatherium hendeyi). The New England Aquarium's own African penguins (also known as black-footed penguins or jackass penguins) are members of the sole species that breeds in Africa today. These fine fellows appear to be newcomers to Africa. 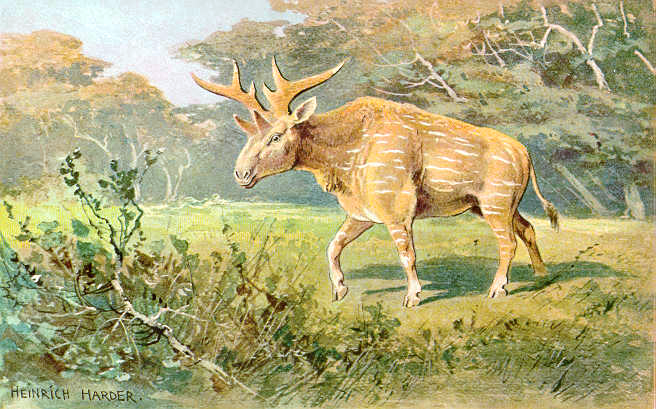 They only start showing up about half a million years ago, at a point when all the ancient species seem to have already vanished. black-footed penguin for scale. Fossil art by Kristin Lamm, living penguin art by Barbara Harmon. So the march of penguins was completed. Beyond the three continents we covered, penguins also live on many small islands today, though we have little knowledge of their ancient history in these locales because fossils tend not to be available. Far from being restricted to icy Antarctica, penguins have truly conquered the myriad environments of the southern hemisphere.